5619 Hunter St. – GM Home Inc.
Home Project 5619 Hunter St. 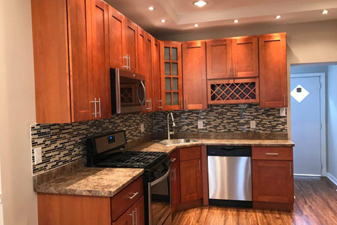 Welcome to this gorgeous, completely renovated home in the lovely Overbrook neighborhood. The living/dining areas are complete with brand new floors, fresh paint, recessed lighting and beautiful wood accents throughout. The kitchen is equipped with stainless steel appliances, plenty of cabinet and counter space and modern back-splash. There are four great sized bedrooms and two full baths with brand new fixtures. The full finished basement could easily be converted into an additional bedroom or family room with separate utility area. Additional upgrades include updated plumbing, electric and a brand new HVAC system.